A Pakistani company went from losing five bids to Chinese companies to winning one jointly with a Chinese firm. “Pakistani firms have been denied contracts for power and other projects; equipment and raw materials for the(se) projects are being imported (from China); labour (technicians, managers, engineers, etc) too are coming from China.” A.R. Dawood (Daud), the CEO of a leading Pakistani company Descon Engineering, pointed this out, as quoted in Dawn in January 2018. Dawood’s tirade was one of the rare cases of a Pakistani businessman’s criticism of his country’s preferential treatment of Chinese companies. Islamabad and Beijing call themselves “all-weather friends” and until half a year back the weather was straight from the monsoon season. A nourishing but addictive rain of Chinese loans for energy and infrastructure projects came down on Pakistan. Most of these initiatives are considered to be a part of the China-Pakistan Economic Corridor (CPEC). But with Chinese money came Chinese firms that secured many deals and favorable conditions — often at the cost of Pakistani firms. While the strong bilateral ties do not seem to be in danger even now, a degree of change was felt in mid-2018, when a change of government took place in Pakistan. Imran Khan’s party, the Pakistan Tehreek-e-Insaf (PTI), took over power from Nawaz Sharif’s Pakistan Muslim League-Nawaz (PML-N). Imran Khan and his PTI had earlier acknowledged the value of CPEC but demanded certain redistributions of its projects. Andrew Small has claimed that Beijing preferred the PML-N’s rule and had apprehensions about the PTI but had to come to terms with it. 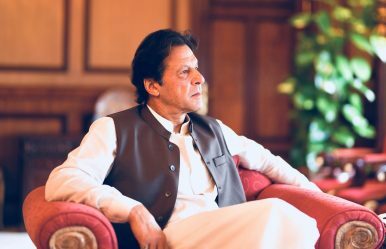 When the PTI formed the government in August 2018 and Khan became the new prime minister, he immediately tried to reassure China of his continued will for cooperation. But guess who became one of Khan’s economic advisers? The same A.R. Dawood of Descon, one of Pakistan’s most successful industrialists. Approximately one month after Khan was sworn in, Dawood again voiced his doubts, arguing that as the current conditions of the initiative are not that favorable for Pakistan, CPEC projects should be halted for a year while Islamabad renegotiates them. To be sure, Dawood’s voice was a minority one (among the public ones) and his opinion was lifted to Himalayan heights by foreign media hype (some international media outlets portrayed Dawood’s suggestion as Islamabad’s decision). Pakistan’s government went into danger-control mode and Dawood himself backtracked. Yet, he was not the only one within the PTI government to share such concerns: this voice and another were also of importance. Dawood’s claims can be read on three levels. First, they represent one shade of opinion within the current government. Second, they represent the voice of a former CEO of Descon. Earlier, in January, as part of the already-quoted criticism, Dawood did admit that his company lost five bids for CPEC projects to Chinese companies. So when he was saying that Pakistani firms are being unfairly treated under CPEC, he might have simply meant that his company was unfairly treated. This, however, does not diminish the importance of his observations on how much Islamabad’s deals with Beijing were imbalanced. Thirdly, an interesting aspect was highlighted by Tom Hussain: the Dawoods of Descon represent the “Karachi lobby” of Pakistani business. Karachi, the trading heart of Pakistan, is located in the Sindh province. In the last five years the PML-N government allegedly favored the “Lahore lobby”: Lahore is in Punjab, the PML-N’s political fortress. Looking through such lens one could assume that Dawood’s artillery volley against CPEC was less about Beijing-Islamabad relations, but more about the shifting dynamic in the internal tussle of Pakistani interest groups and patronage networks. Each party may push its friendly companies into bids and deals, and this is hardly something specific to Pakistan. The first day of 2019 brought an interesting U-turn, however: Descon emerged as one of the winners of a bid to build the Mohmand dam, in a joint venture with Voith Hydro and… the China Gezhouba Group, a construction and engineering company. The dam is to cost $2.21 billion and Descon is to have a 30 percent share in its construction, and Gezhouba the majority remainder. The dam is to come up in the area above Peshawar in the Khyber Pakhtunkhwa province (where the PTI had won its first election and where it is in power now). I wonder what Dawood has to say about the preferential treatment of Chinese firms in Pakistan now? A hue and cry is being raised in Pakistan now about a conflict of interests (and even a PTI politician has joined the critics’ choir). The defenders of the deal point out that Dawood had stepped down as Descon’s CEO upon becoming the current prime minister’s adviser. Sure, but one of his sons, Taimur Dawood, is now the company’s chairman, and the other, Faisal Dawood, is its CEO (as confirmed on the firm’s website). A.R. Dawood had promised this to be a one-year solution and that he will find a professional manager — not a family member — to be the company’s CEO. But it will be difficult to shake off the perception that the award of the Mohmand dam deal to Descon while its founder and current CEO’s father was the prime minister’s advisor could have been a result of undue preference. But what does this tell us of the state of current Islamabad-China relations? It seems that since Khan’s swearing in August 2018 these went through two phases. One started around September when a few politicians — not only Dawood — suggested to alter some of the rules along which deals with China are built. These voices appeared as islands of skepticism on the sea of China praise. But there were also other signals that the all-weather friendship had entered the phase of an early autumn chill. Khan went to Beijing in November and reportedly came back empty-handed. In September, Pakistan’s minister for planning and development suggested that the financing model under which the Karachi-Lahore-Peshawar railway is to be expanded and modernized with the help of a massive Chinese loan had been too risky; it thus seemed that Islamabad wanted to renegotiate the form of China’s financial involvement. Media reports that Islamabad had to share the information on its debt to China with the IMF perhaps added one drop of oil to the already kindled small fire. Then at the beginning of January 2019 at least two important pieces of information emerged: one about the Mohmand dam and the other that China will lend $2 billion to Pakistan (which currently is reserves-starved and in negotiations with the International Monetary Fund for a bailout loan). We could, of course, believe that the bid was a fair competition and the timing of winners’ selection may be a coincidence unrelated to dynamics of politics. After all, the Descon-Gezhouba consortium was said to enter the bid before the transfer of power in Pakistan took place. If we do not believe in such chronological coincidences, however, then the importance of the Mohmand dam case can be read as a part of an attempt to solve either an internal or an external tussle. Externally, the dam bid and the (unconfirmed) news of a fresh loan may suggest that relations with Beijing are returning to a warmer phase. It may be pointed out that the only other bidder for the Mohmand dam was a joint venture between the Power China Company and Pakistan’s Frontier Works Organization (which is a military company, and PTI is considered to be close to the army). Thus, an alliance of Pakistani and Chinese firms would win anyway. But the fact that the bid was concluded right now suggests that after initial hiccups between Beijing and the new Islamabad establishment—and perhaps after behind-the-doors negotiations, certain conciliatory steps were taken. The impression that the joint projects are being put on hold will now slowly be dispelled. Internally, the deal may secure some the interests of a major Pakistani company within a new power nexus. In addition, the dam may stop the waves of criticism by an influential industrialist. As neither China nor Pakistan could afford the failure of the CPEC, local mistrust should be a serious concern.